The explosion of Her Majesty's Royal Post boxes in Montreal in the 1960s announced with a bang that things were changing in Quebec. Although the work of a radical fringe, the bombings awakened the rest of Canada to the reality that Quebec had gradually been changing. It no longer fit the image people had of a rural, agrarian, Church-led society. And it was not willing any more to remain subserviant: agreeably yielding to the power, control and authority of another.subserviant to the English bosses. Since the Conquest, business leaders in Quebec had been overwhelmingly English-speaking, from the early British merchants of Montreal to the increasingly American branch plant executives of the post-war period. But as the industrialization of Quebec took off after the Second World War, Quebec society began to change. It became more urbanized and even those still living in the country were less isolated because of the spread of television. Traditional values changed and the control of the church was undermined. When Duplessis died, his brand of authoritarian control over the people of Quebec died with him. The election of the Liberal government of Jean Lesage in 1960 began a period of almost 20 years that has been called the Quiet Revolution. Lesage set a new direction for Quebec. He established a Ministry of Education in 1964, announcing that education was not just a tool for teaching the catechism and Roman Catholic beliefs. It should also help prepare a skilled industrial work force. He was determined to "de-colonize" the Quebec economy and put more French Canadians in managerial positions and he took resource control out of foreign hands by nationalizing many private electrical power companies and placing them under Hydro-Quebec. 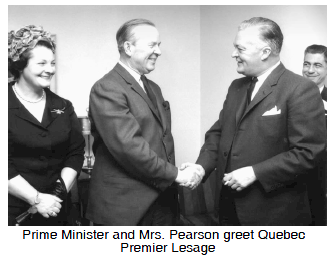 In this he was helped by his Minister of Natural Resources, René Lévesque, the man who would later leave the Liberal party to found the separatist Parti Québécois in 1968. The "péquistes" were committed to a separate, independent Quebec relating to the rest of Canada through a system of "sovereignty association." 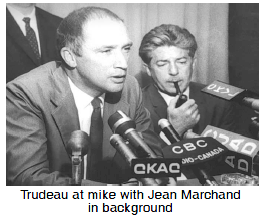 Also in 1968, Canada succumbed to Trudeaumania, electing as Prime Minister a young, intellectual contemporary of Lévesque's - Pierre Elliott Trudeau. Trudeau was as passionately federalist as Lévesque was separatist, but in the beginning both held similar aspirations for Quebec - that its people should enjoy respect and equality with the rest of Canada.